Nobody knows how to fight terrorism. In spite of having co organized the largest conference to study terrorism ever hosted, neither do I. Still I will make a statement about terrorism and Israel´s anti terrorist policies. Terrorism is about angry people who hate the status quo and want change it through terror. The key to deal with terrorism is to focus on recruitement, in what turns a non terrorist into a terrorist. Terrorism is an industry that is fueled by anger. To make it harder for terrorists organizations to recruit we have to make it harder to make their case for anger. I imagine Hamas or Hezbollah recruiters as people who go to sympathizers and show them proofs that USA, UK, Israel, Spain, are countries who should disappear from the face of the earth. Some are convinced and the terrorist ranks are increased. So the more “proofs” we give these recruiters the easier we make their job. I don´t think global terrorism will ever vanish. It will be more or less intense. I also believe that fighting terrorism is like trying to tackle a statistical process in which we don´t aim to stop it altogether, we simply aim to make it unlikely. Like many other forms of crime there will always be some frustrated individuals who believe that killing innocent people will somehow make the world the world a better place (remember Timothy McVay). This leads me to a conclusion about Israel policies against Hezbollah and Hamas. Even though I am Jewish and have a natural sympathy for Israel I disagree with the Israeli invasion of Lebanon of 2006 and the current invasion of Gaza. I disagree on three grounds. One is that I believe attacks of this kind make the moderates in Lebanon and Gaza more likely to become radicalized against Israel. Secondly that I believe it is immoral to kill innocent civilians regardless of the fact that Hamas uses them as human shields. And thirdly I believe that just as Hezbollah went from being a minor force in Lebanon disliked by most Lebanese to being seen as the defenders of Lebanese sovereignty I see it likely that Hamas will emerge from this conflict as victors in the eyes of the Palestinian population. And while I think that Hezbollah has no reason to attack Israel nor hate Israel and should focus instead in making Lebanon a better country I do think that while I disagree with the methods of Hamas I and probably most of my readers agree that it is time that the Oslo two state solution is implemented. So far Hamas is easier to oppose because their aim is the destruction of the state of Israel but if their objective evolved to the creation of the Palestinian state they would be as legitimate as Fatah. And most of us want to see a sovereign Palestinian state alongside a sovereign and safe Israel. Israel went into war with Hamas with a clear military objective, to make Hamas stop their rocket attacks on Israel. But these attacks that had not been lethal before the invasion are now both lethal and more intense making it easier for Hamas to claim that they are “winning the war”. Now when Israel negotiates a cease fire Hamas will be seen as victors by the Palestinian because they were able to fight until the negotiation, that they were not defeated just like Hezbollah was not defeated. And in the future it will be easier for Hamas to recruit members among the angry unemployed youth of Gaza. What could have Israel done in both cases? More targeted and limited air attacks without a ground operation with an objective that is clearly military. If Israel invades Lebanon because they kidnap two their soldiers or kills 600 people in Gaza because they fire rockets without victims and in both cases there´s tremendous infrastructure damage the enemies of Israel will grow in numbers throughout the Middle East and around the world. If PR plays a significant role in conventional warfare in the case of terrorism it plays a crucial role and Israel is losing the PR game and so far not increasing its safety. Why say that Osama was unarmed? War is probably the most obvious proof of weakness… but it is probably a lot easier to speak from a country which is not the target of daily rockets. My only wish is that the Isreali power will start to be “stronger” in its “tolerance” toward these rockets, because each civilian killed in gaza will generate at least 10 new “terrorrist” who will sooner or later bomb israel. Martin ! The Hamas don’t want a Palestinian State. They don’t want to sign for an Oslo peace. They just want the destruction of Israel ! All what you’re saying is out of matter. It was impossible to negociate with Hitler. It’s impossible to negociate with the Hamas. Israel wants 2 states . Israel wants peace. Hamas don’t. It’s a big problem but the only solution is to fight the Hamas with an army and not with words. Are 300 homemade rockets going to dstroy Israel ? Are 300 suicide bombers destroy Israel ? Are they just that stupid ? I think that using social media like youtube (http://www.youtube.com/watch?v=p–x0NCdJH4&feature=related) or twitter is a good thinking in the media handling of the events. Lets not forget that terrorists organizations have long been using the net to carry their messages, including videos of kidnap victims, decapitations, etc. Now…it is also clear that the definition of war has changed…shouldn’t we change the definition of public diplomacy also? When handling such things as wars, it is very important to speak to every demographic in a language they understand…and making your generations understand the “reasons for war” may be a move in the right direction, after all the “youtube generation” is the one who will govern us next. Sometimes as in Business Deals, whatever you do, there is no DEAL… That happens when your counterpart is not interested. I do not think Hamas is interested in doing a deal on behalf of the Palestinian people. Hamas won t manage to recruit more, because the recruitement process is already in place for ages at the youngest age. Their hate of Israel won t disappear with this war. The definition of Moral is when you have the choice of Good on bad. In a war there is nothing moral. choosing to shoot terrorists that hide behind citizens (which they most of the time discover only after they shot) is terrible. Immoral is using human shields, is cultivating the love of death and forcing its citizens to believe so. immoral is teaching your kids to kill and hate. Israel i believe has created a point of tension for inner explosion of hamas. Um, Israel isn’t fighting terrorism, they’re advancing their campaign of terror and genocide against the Arabs whose land they stole. Oppressed people fighting an occupying army are not terrorists, their insurgents and patriots protecting their fellow man. Turn off the TV and learn what’s really going on. Israel went to Oslo and what did it get in return? Hamas blowing up buses in downtown Tel-Aviv. Actually, Hamas is just a proxy force of Iran. Israel is fighting Iran by proxy. Nobody wants the occupation and the two-state solution poses the problem of Palestine as a new failed state. If Hamas could launch rockets from the West Bank, then it would de facto destroy Israel by closing down Ben-Gurion Airport. The only realistic solution is to return to the status-quo pre-1967, that is, Jordan to annex the West Bank and Egypt the Gaza Strip. And let Hosni Mubarak security services deal with Hamas. And, perhaps, in 25 years, an independent Palestine. Maybe the Zionists could pack their stuff and leave, profusely apolgizing on their way out for the pain and suffering they’ve caused. Hamas had support from Iran but so what, the US supports dictators all across the globe. The fact is Hamas was elected by the people there. End of story. I already switched off the TV and stopped reading European traditional press, where the blind anti-Semitic prejudices inherited from the historical positions of the extreme left still inspire the intelligentsia and their gospel of accepted, politically correct truths. I turned myself to electronic media to have a more intellectually challenging debate. I was ready to contribute to the debate that Martin opens. I tend to disagree, in degree, with him. But in every blog that tries to discuss something seriously there is always the illuminated extremist that lowers the general level of the discussion. Jeffrey Henderson, you have that dubious honor today with your sweeping hatred statements. It is a waste of time starting de-constructing you simplistic logic… But I cannot resist myself, the same as I cannot resist confronting brain dead Nazis abusing people in a tube station. So the Israeli people (all, including Arabs, or just the Jews? ), have a plan to exterminate the Palestinians (the ones in Gaza, the ones in the West Bank, also the ones in Jordan and elsewhere?). And in order to do that, they provoked being attacked by a confederation of Arab nations in a cople of wars, so that they could occupy those territories… And now they have embarked in the slow process of targeting rocket launching facilities, killing Hamas terrorists and a few civilians each time. Plus sending in their troops and putting their young ones at considerable risk. Why doing that if Hamas-style indiscriminate use of Israeli military might would do just that (extermination) in about a few minutes?. And, then, Hamas warriors are insurgents and patriots… Model ones, I might add. Hiding behind civilians that they use as human shields, sending suicide bombers to blow themselves up targeting civilian in buses. How do you define terrorism, then?. And if it is a war, how do you define war crimes?. To complete the more habitual plethora of non-sensical slogans we have the expulsion, the refugees and the right to the land… Whenever I hear somebody has been a refugee for 60 years, for 40 years… You may be an exiled, but not a refugee. And if your grand-grand father was an exiled, that does not make you one. Where do claims to something like that end?. Do we evacuate the USA and return it to the American Indians, and Australia to the Aboriginals?. Do these Islamists have a claim over Spain, or do we Spaniards have a claim over Cuba?. Since they were expelled, and tens of years later they have a claim, wouldn’t that catatonic logic justify the Jews having an even more ancient and original claim over the Greater Israel?. Hatred? I say stop killing innocent people and give them back their land and that equals hatred of all jews? One of the Zionists great PR tricks is to equate anti-zionism with anti-semitism. I personally am against all ruling class elitists that want to take over the world and bring pain and suffering to untold millions of people. The situation in Israel and Gaza is similar to Iraq in that the people who have a right to be there are trying to expel an outside force which has violated their sovereignty. It’s really quite simple. If I woke up tomorrow and their were Chinese troops going down my street they’d get the same treatment as US troops in Iraq or IOF (Israeli Offense Force) troops are receiving in Gaza. So, if loving freedom and defending the oppressed is hateful then you’ve got me figured out. homes of its own people. For Hamas the only thing more prized than dead Jews are dead Palestinians. on Mickey’s path to martyrdom). Palestinians their first sovereign territory ever in Gaza. side. And of course firing rockets unceasingly. open about it. Israel’s very existence. inevitable civilian casualties. Bring down the world’s opprobrium on Israel. Force it into an untenable cease-fire — exactly as happened in Lebanon. Then, as in Lebanon, rearm, rebuild and mobilize for the next round. implicitly acquiescing to a state of active war and indiscriminate terror. three years ago: no rockets, no mortar fire, no kidnapping, no acts of war. again. It can ill afford to lose any more wars. La chicharra progresista gusta de ver la entrada de Israel en Gaza como la de William Munny en la taberna de Big Whiskey: «Quien quiera vivir, que salga». Al pistolero encarnado por Clint Eastwood, después de descerrajar un tiro al tabernero, le reprocharon que hubiera disparado a un hombre desarmado: «Debió armarse cuando decidió decorar su taberna con el cadáver de mi amigo». Hamas no olvidó armarse, en la medida en que se lo permitió el bloqueo, cuando decidió granizar con misiles el sur de la nación cuya extinción anhela. Y, aun así, los motivos por los que Israel entró en la taberna no están claros para los custodios de la conciencia colectiva. No lo están porque la ocultación de los mismos es necesaria para atribuir a Israel una conducta psicópata, de maldad pura, de cartel de Wanted: «¿Es usted el William Munny de Misuri que mató a mujeres y niños porque sí?». Y si los motivos afloran, si de pronto se hace inevitable discutir sobre ellos, entonces hay que reducir su importancia para que no sirvan de coartada a un comportamiento irracional. O «desproporcionado», que ése es el término oficial. Es entonces cuando los misiles Qassam pasan a ser mercancía de una tienda de artículos de broma, inofensivos como el corcho de una escopeta de barraca de feria que por supuesto matan mal: los judíos de la ciudad de Sderot que disponen, cuando suenan las sirenas, de quince segundos para alcanzar el refugio son tan tontos que no se dan cuenta de que su manía de intentar sobrevivir deslegitima en términos morales la campaña de Israel contra unos bombarderos para los cuales la población civil no es daño colateral, sino objetivo. El presidente Zetapé se pronunció ayer sobre el incendio en Oriente Próximo. Más allá de esa ingenuidad cursi según la cual la palabra «democracia» es el abracadabra que funde en un abrazo a cualquier enemigo milenario, dijo que la respuesta militar no es «el camino a la paz». Así pues, por paz entiende la resignación a vivir sin protestar ni actuar bajo los misiles, sobre todo cuando éstos no arruinan el postre del televidente europeo porque son omitidos por los cauces de información occidentales: ¿sabía la mayoría de la opinión pública europea que estaban cayendo antes del ataque israelí? ¿Les habría importado? ¿Les importa que, para arrastrar conciencias hacia el ladoceja del maniqueísmo, se esté haciendo pasar por imágenes de un bombardeo israelí las que corresponden a la explosión accidental de un Qassam en un mercado de Gaza? Zetapé también dijo que es necesaria la intervención de un «mecanismo internacional» que estabilice la zona. La pregunta obligada es: ¿por qué ahora, y no hace dos meses, cuando era la población israelí la agredida? Que sea el ataque a Gaza lo que comprometa a los mismos gobiernos que se inhibieron cuando sonaban sirenas en Sderot es una forma de reconocer que había que entrar en la taberna. Hhhhmmmm, maybe this pic will better illustrate the issue at hand. Happy new year all of you. So you got chased around and that makes it ok to do that to Palestinians? So in 500 years when the Palestinians are murdering people in Africa after being given their own country will it be okay for them to point back to the abuses they’ve suffered from the Zionists to justify their attacks on others? First of all I have to admit that after viewing the source of the image you provided the quality of this discussion decreased. Hoping that there is someone reading this post that doesn’t believe in conspiracy theories I will post some facts about Gaza that may be important to recall. It was late 1948 when the British troops leave Mandatory Palestine. It was then when the state of Israel was declared. During its war of independence thousands of Palestinians, fleeing other cities settle in the Gaza Strip, mostly in some kind of refugee camps. That is how today Gaza population is about 1.5 million. After that, the Gaza strip comes under Egyptian military rule, but, the Egyptian government refuses the citizenship to the Palestinians of the Gaza strip. Then came the six day war where Israel captures the Gaza strip territories. UN, Camp David, Jericho, Hamas, The Islamic Jihad, IDF…it was all useless. People keep dieing and the problem was still there, and the same. Hamas took military control of Gaza in 2007 from rival Fatah forces leading Israel to clamp tight restrictions on the border in an attempt to end rocket attacks. How this will end…I have no idea. I just know that when what you want is the destruction of the other, and that is your only objective, then things like what is going on right now are inevitable. I think that a big mistake is to believe that this conflict can be separated from the what is happening in Iraq, Iran and everywhere else in the Middle East, they are all interconnected. Meanwhile the population on both sides are becoming puppets of what seems to be a neccesary evil of the human race. Never go to war, it is as simple and complicated as that. Very simply: they kill dozen more times innocents than the palestinian terrorists killing innocent in israel. What is wrong with Israel?. That it is the country for the Jews?. I believe subjecting Israel to a much stricter test on everything, its right to self defend, the accuracy of its bombardments, the respect of others’ rights… Blaming Israel first, whatever circumstances is impregnated of historic anti-Semitic prejudices, as much as the special laws and treatment that Jews were subject to in many countries for centuries… But it has become so common, that even some well intended Jews embrace that behavior. – The disproportionate response: I did not see a single picture of Serbian children dead as a result of the response of NATO, bombing with significant less accuracy Serbian cities as a means to protect the (Muslim) Kosovar population. – The Palestinian cause: the Left uses very flexibly the right of self determination of peoples, as protected by the UN charter, to promote so called “liberation” movements in the world, including Palestinian’s.. But if it refers to Israel, the obvious, simple exercise of that right encounters many buts and ifs. – The Palestinian ordeal: equally unbalanced is the criticism of Israel as the sole source of the Palestinians’ suffering. Other than their own leaders, methods and organizations (hence, themselves. Internecine Palestinian fighting during the past two years also has dealt a harsh blow to future prospects for peace, with 616 Palestinians killed in factional fighting from the time that Hamas won Palestinian elections in January 2006 through May 2007). But, there are many parties involved. The Palestinians are used by Arab (and now also Persian!) Nations as a distraction for their own internal problems. Why didn’t the oil rich sheiks of the Middle East alleviate the conditions in Gaza?. Where are the demonstrations against Egypt, that closed the border as much as Israel did?. And against Kuwait, that after the first Gulf War expelled 400K Palestinians?. Where is the historical resentment, the eternal war being fought against Jordan, that in 1970 killed about 10K Palestinians and injured more than 15K (as recognized by the UNRWA), more that all the conflicts fought between Jews and Arabs since the 20’s?. – The land: and then, the focus on Israel as the big “land expropriator” against the Arabs. Well, as mentioned in my previous post, where do historic claims start and end?. It seems they are eternal if it refers to anything executed by Jews. But Turkey got large districts from Syria (Alexandretta or Iskenderun). Iran did so by taking Tubn and Abu Mussa islands from the UAE… The biggest example is Arabistan, (Juzestan in Iranian denomination) taken by Iran from Iraq. 64K Sq Km (three times the size of Israel), 4.5 MM Sunni Muslims “invaded”. 120K Ha. of land expropriated from Arab land owners by the Mullahs, 550K Persians in “settlements”… Where is the Focus of the Arab League?. – The humanitarian situation: The humanitarian situation is Darfur has been critical for years. Something that truly can be described as genocide (a word so frequently used in an exaggerated way, and typically to offend Jews and their memory). The problem is that the perpetrator is an Islamist regime in Sudan. Where is the media, where the demonstrators, where the Christians international solidarity with the victims, where the Muslim Diaspora self criticism?. What’s different in launching a rocket from Gaza to Israel, and launching a missile from a Israeli helicopter to Gaza? Why is the first example terrorism, while the latter is not? There is an element of propaganda that the handle terrorist is attached to people whose military activities are described somehow more immoral than one’s own. Armies are usually not thought to commit terrorist acts, even though by definition that is exactly what they do. I think what usually is described as terrorism is a way of warfare that results from inability to have a real military force with which to defend or attack. So basically terrorism is the last resort when you have nothing else left. If you go one step further beyond problem of recruiting (which is a marketing problem), you should ask why these people are doing this stuff in the first place, and see if something can be done. Always solve the cause, not the effect. …and what is the difference between that and blowing yourself up in a bus with people going to work?. And maybe you cannot find a difference between that and kidnapping a plane and crashing it against two office buildings?. And surely, you could find justification for some of these freaks getting hold of a nuclear, chemical or bacteriological weapon and exploding it in you town, right next to where your kids go to school?. It is so demagogic it is boring. Not to mention most Yihadists do come from wealthy backgrounds, many raised enjoying Western eduation, wellfare and freedom. I am not justifying terrorism nor war. I am fervently against both. The use of word “terrorism” is what I was talking about. Martin: I think people did not get your point. I agree with you 100%, we all know that Hamas are terrorist and they all should die, but we must think and understand that it is a matter of time until others countries in the area, fill them self with even more hate and start helping Hamas or any other terrorist group with lethal weapons and put Israel in risk. We all know that Israel have the best army in the world and USA will always be a good partner, but all that can’t be enough to stop a nuclear bomb or a massive killing. I hope Israel start thinking about the future, instead the present. I don’t know where the solution is, but this is not the way… Those of you commenting the post without even knowing the real daily situation: please have 10 minutes to watch before you write. Israel’s military operation in Gaza is aimed primarily at forcing Hamas to end its rocket barrages and military build-up. But it has another goal as well: to expunge the ghost of its flawed 2006 war against Hezbollah in Lebanon and re-establish Israeli deterrence. That is a sick reality. You don’t understand or you don’t want to understand. It is not Israel, it is the jews. I feel ashamed that European countries don’t do nothing about this conflict, stop what Israel is doing (including the occupation of the Palestinian territories) and then stop Hamas. Both countries want to leave in peace, but there are small groups of people (growing every day) that want to eliminate the other side. Things like the oppression Palestinians are suffering daily or the rockets fired from Gaza are just increasing the amount of anger in both sides which has been historically very high. By the way Tom, @Jeffry’s image about which land is under Isarel control is completely true. I’ve been in Israel and Cisjordania last year and I saw with my own eyes. 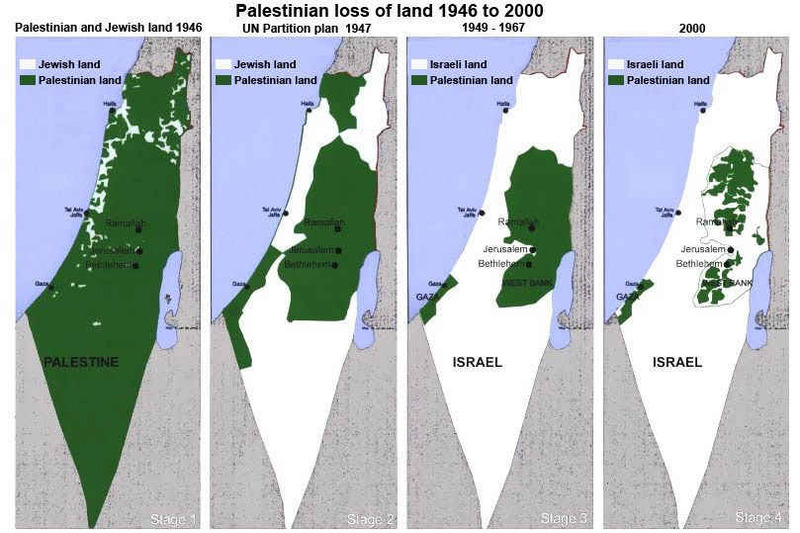 Palestinian territories are divided in three areas. area B: Palestinian civil control (regular police), Israel military control. Israelian military applies it’s own rules. area C: Full Israeli control. Google for maps abou this and you’ll get your own answers since this is publicily available from israeli goverment. The miss one point that war can not solve anything.